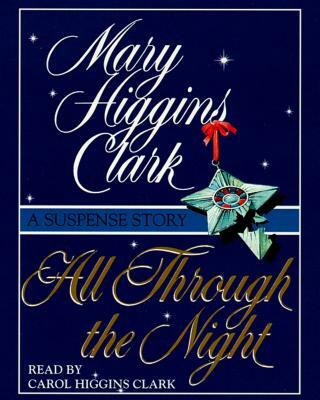 With Silent Night, Mary Higgins Clark, America's Queen of Suspense, gave her listeners their best Christmas present ever. Now, with All Through the Night, she once again celebrates the Christmas season with a tale of suspense that will keep us listening -- all through the night. At the center of the novel are two of Mary Higgins Clark's most beloved characters, Alvirah, the lottery winner turned amateur sleuth, and her husband Willy, both of them caught up in a Christmas mystery that calls on all of Alvirah's deductive powers, as well as Willy's world-class common sense. When the story begins, Willy is looking forward to playing Santa Claus at the after-school center his sister Cordelia has established to care for the children of working parents on New York's Upper West Side, while Alvirah is busy with rehearsals for the Christmas pageant. Alvirah is soon on the trail of the truth, which must be found before Christmas, which leads to the theft of a valued chalice that is somehow at the heart of the mystery. A missing chalice. A missing child. A desperate mother. Who but Alvirah can sort it out in time for Christmas?